WE REGRET THIS PRODUCT IS CURRENTLY UNDER REVIEW AND NOT AVAILABLE FOR SALE AT THIS TIME. What Is OilScreenDNAPL-LENS (Spray)® Used For? A dense non-aqueous phase liquid or DNAPL is a liquid that is both denser than water and is immiscible in or does not dissolve in water. OilScreenDNAPL-LENS (Spray)® was developed in response to a customer's need for the ability to quickly and easily identify the presence of DNAPL Lenses in core samples (without breaking or disturbing the sample material). The result was the launch of a "spray on" dye that colors DNAPLS (including chlorinated solvents like PCE, TCE and TCA) a Royal Blue colour, (as illustrated in the attached photograph). In keeping with our mandate: the OilScreenDNAPL-LENS (Spray)® product is inexpensive, yields fast results and is easy to use. Simply shake the contents of the OilScreenDNAPL-LENS (Spray)® bottle and spray the solution onto the core sample on which you wish to detect DNAPL lenses. 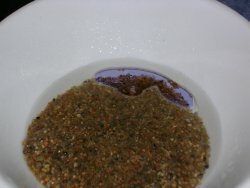 Depending on temperature and the concentration of DNAPL, the color develops in under 3 minutes. OilScreenDNAPL-LENS (Spray)® is sold in � liter hand-trigger spray bottles complete with dyes and surfactants - simply add water, shake and spray! Interested In Trying OilScreen DNAPL-LENS (Spray)?